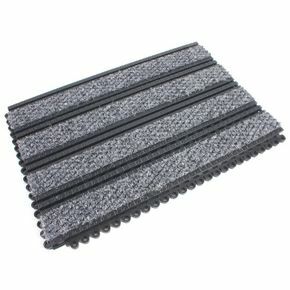 Flexible PVC tile with high quality carpet insert. Fits into mat wells - cut and trim to size. Scrapes dirt and absorbs moisture. Easy to fit - male and female connectors on the tile edge. Suitable for both indoor use and external covered areas. Fire tested to EN13501 Euro Classification E (F1). Tile L x W: 440 x 290mm, height 16mm (18mm 385010). Capturing dirt from shoes at the front door is important as it reduces the amount of soiling brought into your premises and in turn reduces the amount you will have to clean in order to keep your floors presentable. Our PVC/carpet entrance tiles scrape dirt and absorb moisture at the same time to keep your flooring clean and hard floors safer by reducing slip hazards. They are intended for inserting into mat wells and are easy to fit by simply connecting the male and female connectors on the tile edge. These flexible PVC tiles with high quality carpet inserts are suitable for indoor use and external covered areas, as well as being suitable for use with high heel shoes, meaning you won't have to worry about them being damaged by footwear. They are available in a choice of three colours; black/blue, black/charcoal or black/grey and are easy to clean, cut and trim to suit your requirements. Our PVC/carpet entrance tiles are a great way to stop dirt at the door and to stop it messing up your nice clean floor.